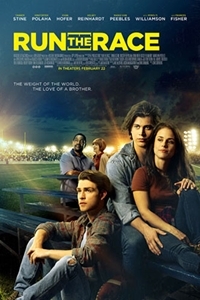 Synopsis: In "Run the Race", two desperate brothers sacrifice today for a better tomorrow. Reeling from his mother's death and his father's abandonment, Zach, an All-State athlete, finds glory on the football field, working to earn a college scholarship and the brothers' ticket out of town. When a devastating injury puts Zach - and his dreams- on the sidelines, David laces up his track cleats to salvage their future and point Zach toward hope.